The Pulsatilla is also called the Pasque flower or meadow anemone and although related to the anemone it is a separate part of the buttercup family Ranunculus. 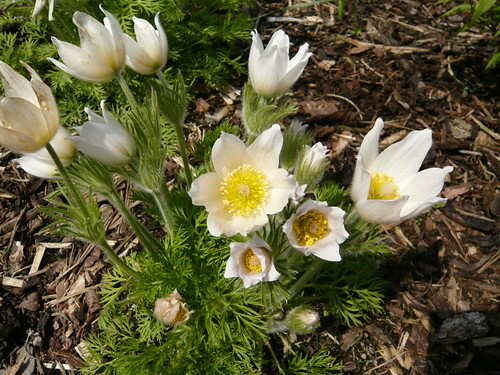 Also commonly known as the prairie crocus, Anemone Pulsatilla, Wind flower and Easter Flowe. This clump forming herbaceous perennial is 6 inches tall and the flowers can be red, blue, purple or white and have six velvety petals with curled, pointed tips surrounding a ring of bright yellow stamens. 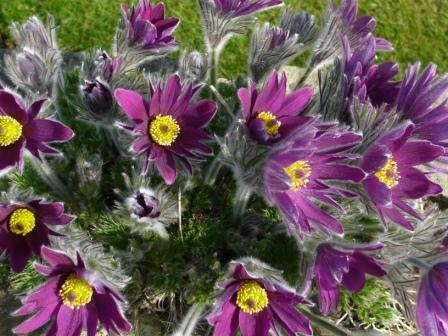 Flowering around Easter they have the alternative native British name of Pasque flower. All plant surfaces are covered in fine, soft hairs as can be seen in this images.The attractive seed heads which follow are spherical with silvery plume like styles raised on elongated flower stems. Not to be out done the foliage is exquisite in spring. The plant is best treated as poisonous although it is occasionally used in herbal medicine. Protect from excessive wet winter weather. They tolerate alkaline soils and are found naturally in the wild. They dislike root disturbance and can be difficult to establish. They can be grown from seed or propagated by root cutting but try not to disturb the main plant as they take several years to flower at their best. Plant when small and leave undisturbed. Pulsatilla vulgaris Red Cloak is a great variety to grow from seed. Rubra is another red variety. Pulsatilla vulgaris is the county flower for both Hertfordshire and Cambridgeshire. Single flowers are followed by attractive fuzzy seedheads resembling those of clematis. What a pretty flower! I have never tried to grow that one.